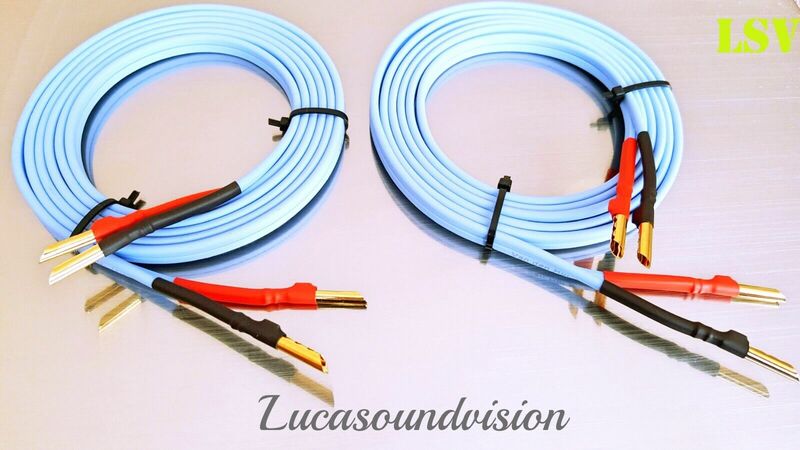 2 x 1m (A Pair) VAN DEN HUL – The SKY-LINE HYBRID Audio Speaker Cables Terminated. • The SKYLINE HYBRID is an elegant small twin conductor loudspeaker cable with outstanding qualities. • The SKYLINE HYBRID is a low priced member of our AWG 14 twin-lead loudspeaker cable range which consists of The GOLDWATER, The CLEARWATER, The BRIDGE, The SNOWLINE, The CLEARLINE and The SKYLINE HYBRID. • The SKYLINE HYBRID is the only Hybrid cable in this range: Each lead combines 19 high purity Oxygen Free Copper strands with a coating containing our Linear Structured Carbon ®. 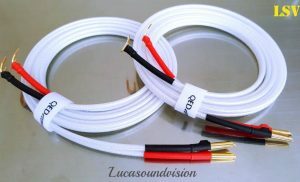 This combination of metal and carbon (hybrid technology) has excellent properties when it comes to resolution and neutrality, and therefore is standard applied in all of our heavier loudspeaker cables. • The SKYLINE HYBRID has been designed to be less flexible than its above mentioned colleagues, reflecting its aim to be used in more permanent high quality loudspeaker wiring applications. • The SKYLINE HYBRID is 8.5 mm wide and 3.4 mm thick. 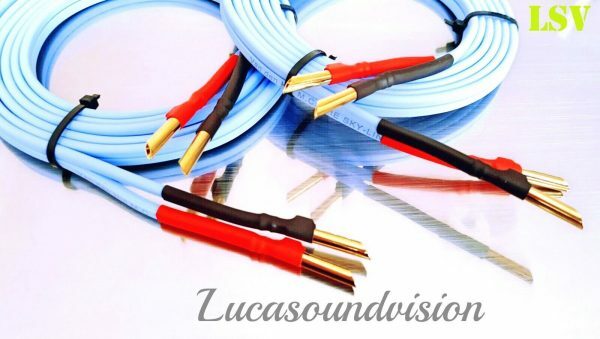 Each of its two 2.04 mm conductors exhibit a resistance of 0.84 Ohm/100 m.
• The cable’s jacket is made of sky-blue coloured HULLIFLEX ® 3, a robust halogen free material excellently capable of shielding the copper conductors from the chemically threatening outside world. The cable’s sky-blue colour quite accurately represents its sonic character: as clear as a cloudless blue sky. 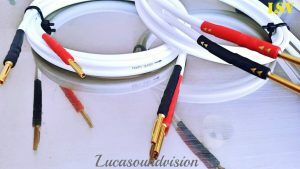 • The insulation of both conductors has a different shape: one is round and the other has two edges with type printing on the flat surface: the most simple polarity finder you can think off. 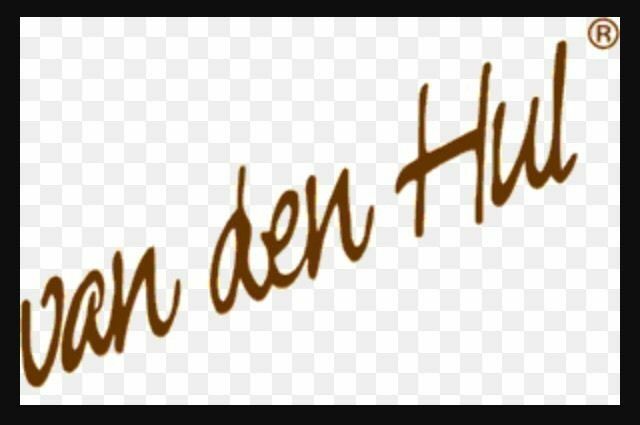 Type printing at 25 cm. (10″) distance facilitates cutting of lengths.